Only 1650 bottles have been produced, after being held in Sauternes Casks from the legendary Chateau D’Yquem. Watch out Glenmorangie Nectar d’Or, an opponent Sauternes finished whisky is in the house!! NOSE: Right off the bat you get a nose full of sweet candy. Some flavored with orange, red apple and apricot. Like you’ve walked into a candy shop that’s owned by a cooper, you can smell the hints of burned barrels behind the closed doors in the rear. The vanilla and honey are undeniable and delicious. No doubt from the interaction with the sauternes cask. The smell of flat sprite comes to mind, which is probably just light ginger, lemon and lime and orange. The wood and spice are not overbearing in the nose but definitely balanced and upfront. 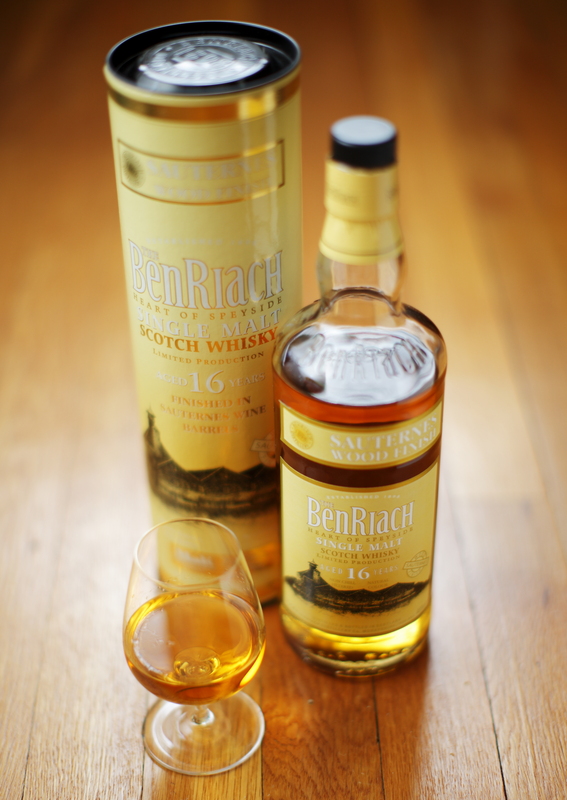 The deeper I stick my nose in the glass the more the caramel aroma deepens with vanilla and toffee richness. I slice a vanilla bean in half and store it with my raisins so they taste amazing in my oatmeal and this smells exactly like the box of vanilla’d raisins. Remember that, Vanilla’d Raisins. PALATE: The golden nectar rolls across your tongue syrupy and sweet. As I swirl the spirit around my mouth the spices warm and surprise every nook and cranny. The flavors of the aromas are all present with the addition of light cracked pepper, lighter spice and the dryness that walnuts give you. There’s a bready quality to it, like I just bit into a sourdough loaf (akin to those from France not San Fran). Nutmeg comes forward, a smell often associated with sweetness but only to be fooled once you eat a spoonful. I want bananas to be found somewhere and then I would say that you’d be drinking banana bread. The spices and sweetness are very similar to a spiced loaf or cookie. FINISH: The finish is long and warming and spice filled. After the flavors of spiced bread leave my mouth, I’m left with a soft smoke or at least light wood that’s been charred and left to smolder in a cold rain making that sizzling sound. I tried the BenRiach a couple months ago when I first purchased it and I didn’t really care for it, well not at least as much as I do now. It’s interesting how a liquor will change in the bottle when all you add is time. The flavor is rich and the sweetness is balanced and with it getting colder and it happening to be raining today, I guess the timing is right.